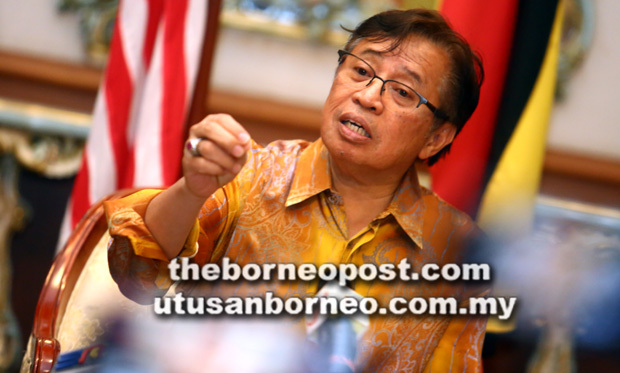 KUCHING: Chief Minister Datuk Patinggi Abang Johari Tun Openg remains confident of winning 28 of the 31 seats after seven days of campaigning in this parliamentary election. The Barisan Nasional (BN) Sarawak chairman, however, declined to name the three seats that the state coalition might not be able to wrest from the opposition. “No, I cannot pinpoint (which) but I know the three seats. I cannot tell you now until that (polling) night. Just now I indicated, (it’s) up to you people (journalists) to analyse,” he told the media at the old State Legislative Assembly (DUN) complex here last night. He had earlier hinted that the three seats “are not in Kuching, but in Sibu and one in Miri”, adding that BN was optimistic of securing victory in Stampin. “(For) Kuching…there is a possibility we can win Stampin. I know the Chinese (community) have to decide between the two (candidates)”. BN candidate Datuk Dr Sim Kui Hian, who is Sarawak United People’s Party (SUPP) president, is taking on Democratic Action Party (DAP) Sarawak chairman Chong Chieng Jen in Stampin. In the 2013 general election, BN lost six seats to DAP and Parti Keadilan Rakyat (PKR). The seats are Bandar Kuching, Stampin, Sarikei, Sibu and Lanang (to DAP) as well as Miri (PKR). Abang Johari said he had visited several areas across the state and based on these visits, he believed that the state BN’s earlier prediction of 28 seats is achievable. According to him, Sarawakians want to see continuity of infrastructure development and the implementation of digital economy. He said people of Sarawak, including those in the rural areas, are ‘receptive’ to digital economy. Citing Selangau as an example, he said 50 per cent of voters there are young people who look forward to the new digital economy agenda as well as the state’s efforts to assert its rights. To a question, Abang Johari said individuals with background in economics such as himself would understand the need for Goods and Services Tax (GST). “Almost all countries in the world have GST, and GST is transparent. SST (Sales and Services Tax) is not transparent because some people can evade SST. Also, the rate of GST is lower than SST. “All developed and developing countries like Singapore and Thailand have GST. Singapore is even increasing its GST rate but we maintain at six per cent,” he said, adding that the opposition kept harping on GST but had failed to mention that SST had been abolished.